Fermanagh start their league campaign against Down with their sights set firmly on achieving top-flight status. Team boss Pete McGrath believes promotion is a realistic target in what he expects to be an extremely competitive season in Division Two. Down, relegated without a point last year, have not won a league game since an April 2015 success over Laois. But McGrath says his former county have improved and will present a formidable challenge under the lights at Newry. "Down know they had a poor 2016 but they have been working hard and had a decent McKenna Cup," said McGrath who led the Mourne men to their All-Ireland triumphs of 1991 and 1994. "They are moving in the right direction. Every game is going to be important in what will be a competitive league." McGrath has named an experienced side for Saturday night's opener with Teemore's Cian McManus the only league debutant. Down are managed by Bryansford man Eamonn Burns who played under McGrath when Down famously hoisted those two Sam Maguires of the 90s. 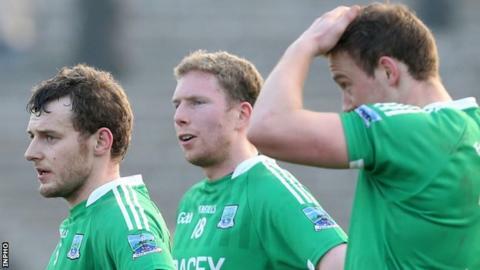 After going through 2016 without winning an inter-county match, Down shaded a 0-15 to 0-14 win over Derry in the McKenna Cup group stages in January, although they didn't make the last four. The addition of former Irish League player Alan Davidson to the Down panel has borne fruit. Davidson, who played for Ballymena, Glenavon and Newry, took up Gaelic football just a few years ago with the Belfast-based Bredagh club, earning a reputation as an accurate free-taker. He will start at left corner-forward on Saturday night in a Mourne side that includes other league debutants, Ryan McAleenan, Glenn player Shay Millar and Saval's Pat Havern. Meanwhile, Monaghan boss Malachy O'Rourke has named an experienced side for Saturday night's difficult away Division One opener against beaten All-Ireland finalists Mayo. O'Rourke's side includes no league debutants with the likes of Drew Wylie, Colin Walshe, Karl O'Connell, Conor McManus and the Hughes brothers Darren and Kieran all included. O'Rourke, entering his fifth term as the Farney county supremo, will be looking for an improved year after failing to make an impression at Championship level in 2016. Mayo boss Stephen Rochford includes nine players who featured in last year's All-Ireland Final replay defeat by Dublin - Keith Higgins, Paddy Durcan, Colm Boyle, Donal Vaughan, Kevin McLoughlin, Jason Doherty Cillian O'Connor, David Clarke and Stephen Coen. Rochford hands league debuts to Castlebar's Donie Newcombe and 2016 All-Ireland Under-21 winner Fergal Boland. Monaghan (v Mayo): R Beggan; F Kelly, D Wylie, R Wylie; C Walshe, N McAdam, K Duffy; D Hughes, K Hughes; K O'Connell, S Carey, G Doogan; C McCarthy, T Kerr, C McManus. Down (v Fermanagh): M Cunningham; R McAleenan, G McGovern, D O'Hagan; G Collins, C McGovern, B McArdle; A Carr, J Flynn; J Murphy, C Maginn, S Millar; A Davidson, P Havern, B O'Hagan. Fermanagh: T Treacy; M Jones, C Cullen, C McManus; D McCusker, R McCluskey, A Breen; E Donnelly, L Cullen; B Mulrone, E McManus, P McCusker; E Courtney, Sean Quigley, T Corrigan.